Remember...if Box Springs doesn't have it, you don't need it! 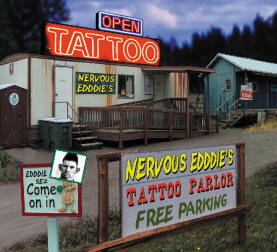 Nervous Eddie's Tattoo Parlor -- "Tattoos While You Wait," This month's special: Get all 10 plagues of Egypt for just $99.95. 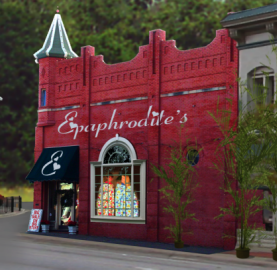 1-886-TAT-TOO-U Ephaphrodite's Nighties -- "Foundations for goddesses of every size." House of Poodles -- Clip and Dip Special: $19.95 (Toenail Painting: $9.95) Wool's Canoe & Tuxedo Rental -- Prom Special: Tuxedo and Canoe Limo: $149.99. Flywheel Depot -- Call 1-886-FLY-WEEL for all your flywheel needs. 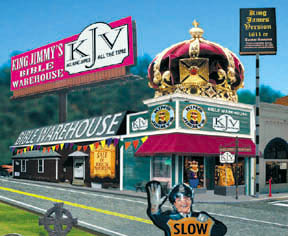 The Box Springs King Jimmy Bookstore -- "If it ain't King James, it ain't the Bible." 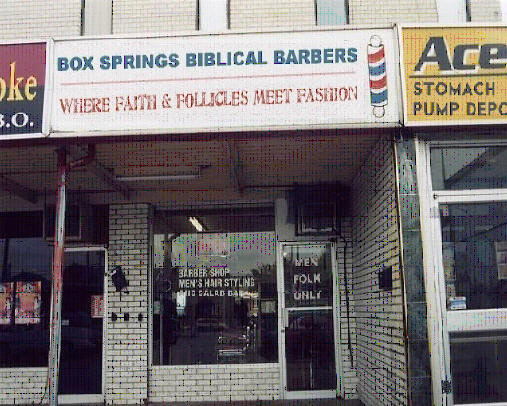 Box Springs Biblical Barbers -- No mullets...sho-lo's...or Samson cuts here. Only 100%, pure, sin-free haircuts. Why not join us for lunch? New giant salad bar. 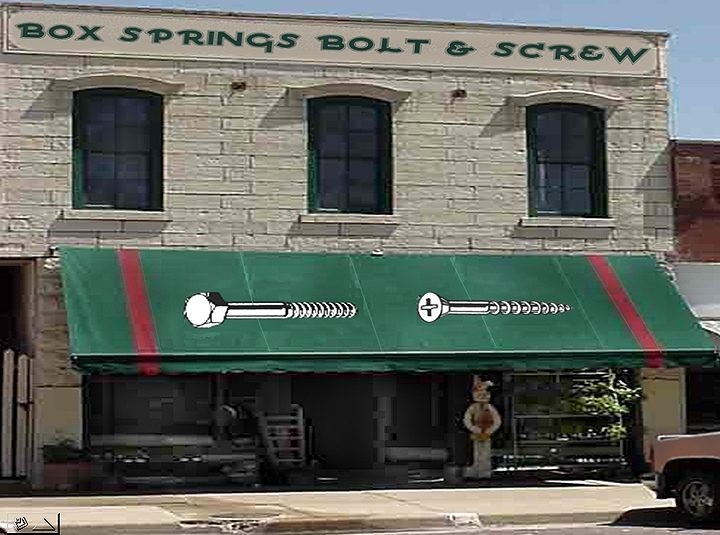 "Clip and Eat" specials now in effect Box Springs Bolt and Screw -- Home of the "Yard Goat" 3000. On sale now! 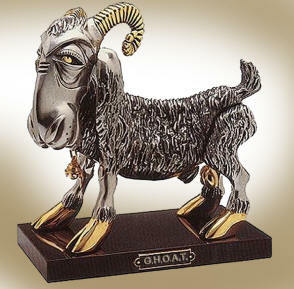 Land O'Goshen Records -- Winners of 5 2006 "Gospel Harmony of America Today" (G.H.O.A.T.) Awards Q-BOX Radio -- Home of "The Glory Bugles Radio Hour," Sundays from 7:00 - 7:30 a.m.
SWIG Sediment Water -- Remember, when you have a powerful thirst, don't take a drink...take a SWIG! Waffle King -- Waffles and pancakes fit for a king. Just look for the waffle on a pole! 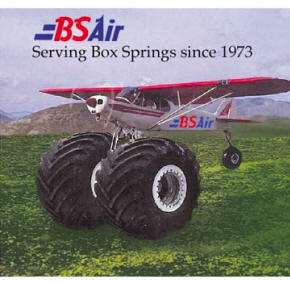 Box Springs Air -- B.S. Air...we'll eventually get you there! 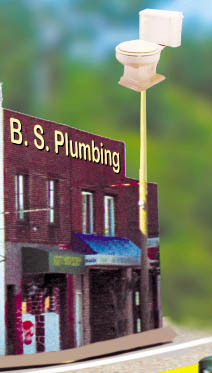 Box Springs Plumbing -- Our customers always deserve a royal flush. 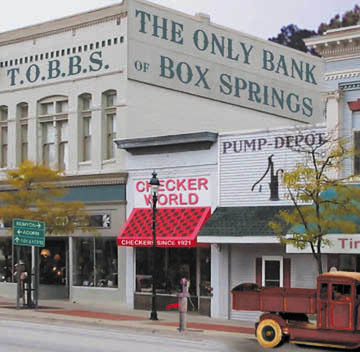 T.O.B.B.S -- The Only Bank of Box Springs. "Where our success is in your interest." 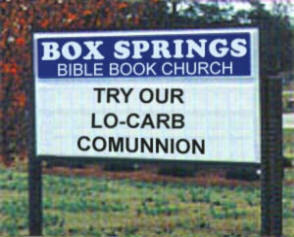 Box Springs Bible Book Church -- By the banks of the beautiful Big Leg River. "Shall we gather?" Grub Mart -- We know it doesn't look like it, but we're open! Come on in. (No gas, though ... sorry ... too expensive.) 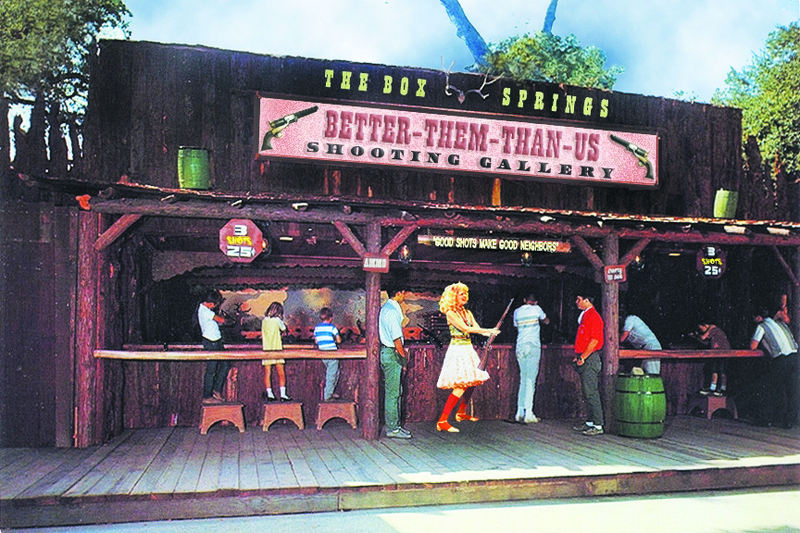 Box Springs Fine Arts Center -- The cultural heartbeat of Box Springs and its surrounding "Bedroom Communities." 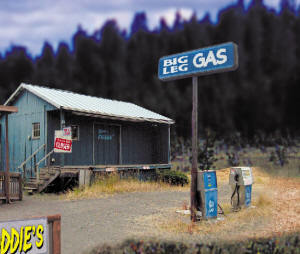 Big Leg Gas -- What more can we say? Last chance to fill up before fishing and splashing in the BLR. Box Springs Drive-In Movie Theatre -- Still playing: "Jurassic Trailer Park"
Box Springs EZ Print -- "We print it right the first time...or the second." Tangential Discount Value Vision -- "True Vision at Discount Prices." Box Springs Discount Coin-Operated Recording Studio, Ltd -- "Making Music for Pennies" (Dimes... Nickels..and Quarters, Too)" Clem Klapper's "Pro Bait" Shop -- Where the pro's shop for bait! Best selection of Curly Tails and Tube Jigs this side of Big Leg Lake. Also, Krazy Blades, Wax Worms, Head Jigs, Slab Spoons, Shad, Cut Shad and Shad Gut. And just in -- Geno's Stink Bait. Visit us soon at "Pro Bait" -- The fisherman's "court of last resort."